FX has finally ordered a pilot for Y: The Last Man. It has been close to three years since the network acquired the critically acclaimed comic series and about a year and half since Michael Green was chosen as showrunner. Created by Brian K. Vaughan and Pia Guerra, Y: The Last Man launched on DC’s Vertigo imprint in 2002 and ran for 60 issues. The Eisner award-winning run has been collected into 10 volumes. 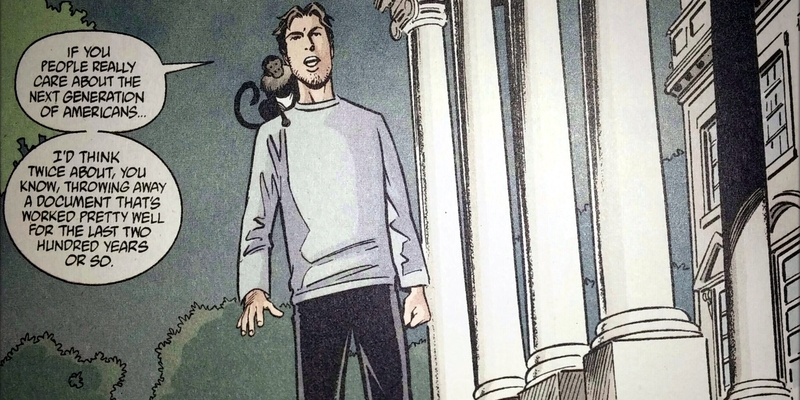 It takes place after a plague of unknown origin wipes out every creature with a Y chromosome, with the exceptions of escape artist Yorick Brown and his Capuchin monkey, Ampersand. Being the only remaining males on the planet, Yorick and Ampersand embark on a journey to unravel the mystery of what happened to the rest. THR reports that Aida Mashaka Croal will be be a co-showrunner, along with Green, and that Melina Matsoukas is attached to direct. Green’s recent credits include co-writing the screenplays for Logan and Blade Runner 2049, as well as developing American Gods with Bryan Fuller. However, the two have since parted ways with Starz. Croal has worked on Marvel Netflix shows, Luke Cage and Jessica Jones. Matsoukas is a well known music video director, but has also helmed episodes of Insecure and Master of None. Vaughan will serve as an executive producer as well. Apparently, this team has been hard at work on a script and the network has finally green lit the pilot. The slow road thus far has been largely due to Green’s busy schedule. FX has given an official description as follows: "All of the men are dead. But one. Y traverses a world of women — exploring gender, race, class and survival.” Y has had a long and complicated journey to the screen thus far. Originally conceived as a feature film by New Line, it fell apart when the studio refused to produce the story as a trilogy. The project would change hands again before the rights reverted back to Vaughan. This isn’t the writer’s first foray into television. He has worked on shows such as Lost and Under the Dome. Runaways, based on a series created by Vaughan and Adrian Alphona recently wrapped its first season on Hulu. Season 2 is set to begin filming this month. Vaughan “wanted to find someone who loved the source material but didn't feel so indebted to it that they would be afraid to change it.” Green’s work on adapting Neil Gaiman’s American Gods, as well as his treatment of other established characters proves that he can creatively render the source material to a new medium without being strictly beholden to it. Y has had a number of outspoken admirers over the years, among them, Joss Whedon, Zachary Levi and Elijah Wood, who hopes to star in the upcoming show. In our current political climate, the series has become more relevant than ever and according to Green, his vision drastically changed after the 2016 election. The writer stated, “It couldn't not be political, and I had to embrace it, and I had to find my way in, and I had to find a way to channel my own dismay, disappointment and rage into it, while still keeping it what it is.” Between the epic scope of the story, the incredible talent involved and the passion for the comic itself, Y: The Last Man should have no problem doing the source material justice.